Monika graduated from University of Warmia and Mazury in Olsztyn (Poland) in 2003. At the end of 2003 she did Italian Veterinary degree exams in Turin (IT) to have her veterinary qualifications recognised in Italy. She worked for about 3 years in Rome in referral practice. In 2009 she completed General Internship in Glasgow Veterinary School followed by Diagnostic Imaging Internship in AHT Newmarket. 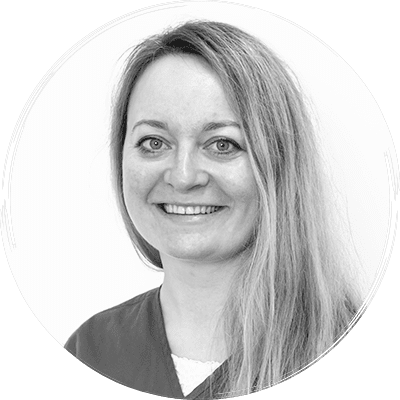 At the end of 2012 she completed Diagnostic Imaging Residency in Glasgow Veterinary School (mixed track SA 70%, LA 30%) after which she worked for one year as an Assistant Radiologist in University of Bern. After that time she moved back to UK and worked for nearly 4 years in Oncology Referral Centre where she was responsible for most aspects of day-to-day management of the Diagnostic Imaging Department. Monika passed her DipECVDI examination in February 2017. She joined the Davies Veterinary Specialists team in June 2017. “I enjoy all the aspects of Diagnostic Imaging, especially ultrasonography, radiology, neuroimaging, and cross section Imaging. I love working in a happy environment with people full of passion and compassion towards our patients. I am happy to work at Davies Veterinary Specialists because this is one of the many values I noticed since the first visit.